NAK said “terrorists” attacked a police post in Grozny around 1:00 a.m. (2200 GMT) and then stormed offices housing local media and a school. Footage obtained by Reuters showed clashes at night and in the morning that included persistent small arms fighting and what looked like a shoulder-fired missile striking the media building. The building’s workers said one civilian had suffocated to death as fire engulfed the building, though authorities did not confirm the report. A video posted on YouTube suggested the attackers had entered Grozny in an act of “retaliation” for what it called the oppression of Muslim women. NAK said on Thursday evening its “anti-terrorist” operation was over and all suspected militants killed. A Reuters witness in Grozny said security forces had deployed military vehicles in the streets, set up multiple check points in the city and closed off the affected area. “We didn’t expect this to happen, the devils showed their last strength,” Chechen leader Kadyrov told reporters in Moscow after attending Putin’s speech. 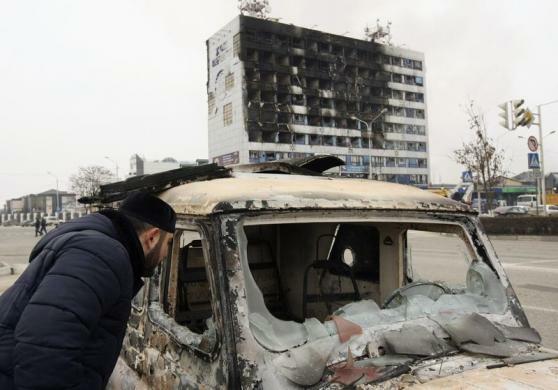 Kadyrov keeps a firm grip on Chechnya after separatist wars there in 1994-96 and 1999-2000, but an Islamist insurgency has spread across the predominantly Muslim North Caucasus region. In October, five policemen were killed and 12 were injured in Grozny in a suicide bombing attack.